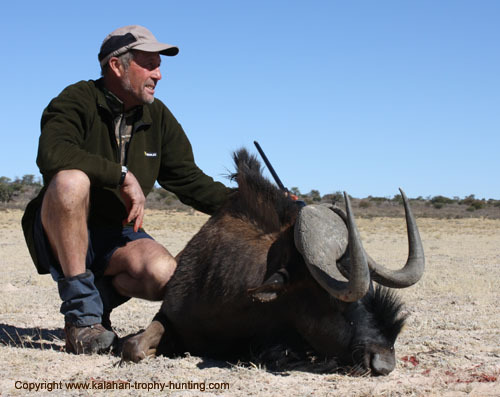 Picture top right: Warthogs are so ugly - yet so beautiful... John Anselmi of New Zealand with his huge Warthog trophy taken during June this year. Winds from the north; the first signs of moist air and clouds; more encounters with snakes; buds and flowers on the bushes and trees; the overwhelming smell of Acacia flowers filling the air at dawn and dusk; fine and mild days and cool nights.... these are all signs that Spring has arrived in the Kalahari. How wonderful to witness all these signs of new life in nature! Winter has gone and together with the new green leaves and flowers in the veld, little lambs and calves of especially Gemsbok and Springbok are born. Some of the little ones are already strong enough to trot alongside their mothers. We know that all the beautiful flowers on the trees and bushes will soon be nutritious pods for the animals to feed upon. Although we do not have much grass on the veldt this year, the animals are masterly opportunists - reproducing, notwithstanding the current conditions. Especially in times of drought, we become witnesses of God's work and ruling in creation: as we see it, there may not even be enough food for the animals, but they adjust marvelously to their environment. This situation makes Spring this year all the more special for us. Picture right: Our daughter at a Black thorn bush, flowering in profusion. Although Namibia's hunting season will only be closed on November 30th, our hunting season has come to an end. From September onwards, the temperatures in the Kalahari are getting too warm for hunting. But we can now look back on a wonderful and busy hunting season here on Uitspan. We had the honor to meet many special hunters and hunting-families during 2009. The times we could share with old and new clients and guests, were just marvelous. We have so many good pictures of these times and will share the best of them with all of you in the future issues of our newsletter. Click here to have a look at some of this year's hunting pictures. Welcome to all the new subscribers. 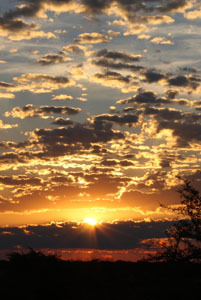 May our newsletter brings the Kalahari and hunting here, home to you! The new free Kalahari wallpaper for you this month, is a close-up of a Black thorn bush's flower. This real "Kalahari Spring"-picture will be the perfect decoration for your desktop. "When it is too hot to seek food, the ground squirrel looks for the shade of a tree where the sand is a little cooler and he lies belly-down with legs outstretched in an endeavor to lose heat to the ground. Meerkats and yellow mongooses have been seen using the same method. Nevertheless, the Hyena goes a little step further by urinating in an attempt to cool the sand even more, before laying down on the wet surface. That is why they are mostly so malodorous. " At the end of May, Frans and Hennie Wessels, Gary Doms and Jaco Louw from Cape Town, South Africa, hunted with us on Uitspan. This was their third time here. They hunted for meat and took several animals. 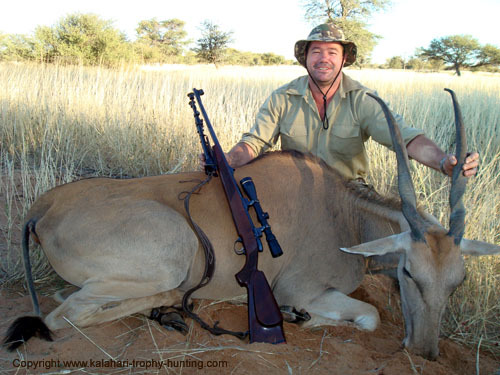 Picture above: Gary with his Eland, hunted for meat. 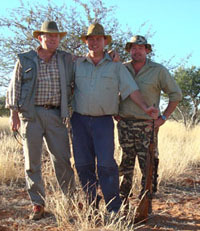 Picture left: Frans, Jaco and Gary in the Kalahari. Picture right: The hunters loading their Kudu on the truck to be taken to the house for slaughtering. 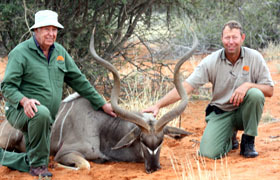 Picture above: Jaco and Gary with the Kudu Jaco took. 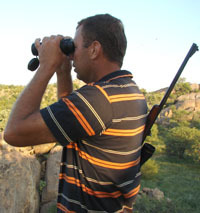 The meat hunters from South Africa were followed by our biggest hunting group of 2009. From the moment of their arrival, we had a busy but most enjoyable time with Tom Brough, CJ and Brett Campbell and John Anselmi from New Zealand. The Kiwis took a total of 30 trophies. Our friend and fellow-hunter Dawie, assist as second PH and hunted with Brett. Picture above: Father and son, Brett and CJ Campbell with Brett's Eland trophy, hunted on Uitspan. Picture above: Tom with a Red Hartebeest. 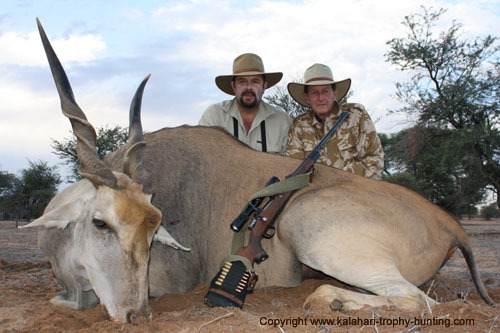 Picture above: PH Dawie with Brett and a special Kudu trophy. Picture above: John with his magnificent Black Wildebeest. Picture above: A collage of the Kiwis - hunting in Namibia. Picture above: Brett and Colin with a Kalahari Gemsbok. Picture above: Tom and Michael sharing a special moment after a Warthog hunt. After their hunt, these men were joined by their wifes and friends. All of them stayed another three days with us in the Kalahari. They left Uitspan for a tour through Namibia and Botswana. Picture above, from left to right: John Casford, Tom Brough, Michael and Jacqueline Boulton, Margaret Johnstone, Dawn Anselmi, CJ Campbell, Peter Johnstone, Brett Campbell, John Anselmi, Larraine Brough (on small picture). Michael Smith with his daughter Allison and Kyle from California, USA. Thank you Michael, for the special package we received from you! Kobus Stofberg with his wife Driena, mother Marie and son Pieter(10) from Rawsonville, RSA. More of a visit to relax in the Kalahari, but Kobus shot some Kudu for us for meat and Pieter took great shot on a Springbok. Tiaan Bindeman from Namibia. The opportunity to take a famous Eland bull. We will publish reports and pictures of these hunts in next issues of our Newsletter. Do not miss them! What is the definition of 'hunting'? "As I see it hunting is a great "product" that is failing to sell in the marketplace, but why? I believe that we have been "advertising" it poorly. Most websites of larger hunter-conservation organizations, for example, refer to hunting as "sport", which it most assuredly is not, and what is worse - the use of the term "sport" has caused great harm to hunting. Or we find terms such as wildlife management, management tool, harvest and population control. Terms from the industrial revolution and agriculture apply to very recent events in human life but not to hunting which is among what Laurens Van der Post termed, "first things", and which Ortega y Gasset reminded us is essential to the "original" man for whom there are no historical precedents. The actual experience of hunting, not abstract, intellectual concepts from ecology, is what bonds us to nature and motivates us to become conservationists. Hunting also teaches many universal virtues to both males and females and these include inner peace, patience, respect for life, courage, generosity and humility. When we begin to accurately define and describe hunting and what it does to develop us into better human beings then there is a chance we can save it and all that it means for society and the environment. God created man and gave him dominion over the animals of the earth (Genesis 1:26-28 ). As hunters, we always have to pray that God will give us the wisdom to fulfill our responsibility to nature and to serve Him - also in our dominion over nature. We urge all our hunting clients who plan to hunt with us in 2010 to make sure that all flights for the period May to July 2010 be booked and confirmed as soon as possible. This is a matter of urgency. As the FIFA Soccer World Cup will be held in South Africa from 11th June to the 11th July 2010, many of the flights into South Africa as well as Namibia are already fully booked for that period. Teams as well as soccer fans will start arriving in South Africa as early as May, and many will stay on well after the final match has been played. So, if you haven't realized that it may be a problem, try to book your flight as soon as possible. 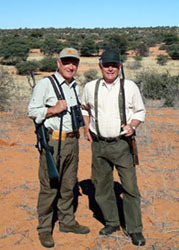 One of our hunters this year has also written a detailed review of his hunt in the Kalahari. We hope to add it to our site soon, Steve! An athlete makes a name for himself by the records he breaks and the amazing statistics that his activities produce. The Lord, our God, however, does not make a name for Himself. He does reveal His name to us in wonderful works; but He competes with no one, does not develop in skills and abilities. He is today what He eternally is. His name, therefore, is eternal and eternally the same. That name is holy because it is set apart from all other names of creatures, since of Him, through Him, and unto Him are all things. He is high above all creation. David, in Psalm 103:1, tells us to bless His name, and then in verse 2 continues: "Bless the Lord, O my soul, and forget not all His benefits." Here he brings us another amazing truth, namely, His name declares Him to be the one from Whom all that we are and have came. Name something you have that pleases you — it came from God, and you have a reason to bless and thank Him. You just cannot mention an earthly object that you have that did not come from Him. Every day and every minute of your life came from Him, and calls for you to bless Him. Learn these words. Commit them to memory and put them into practice. There is a reason why David begins the first two verses with the call to bless the Lord, and then ends the Psalm with the last three verses also exhorting not only angels but all His works to bless the Lord. There is so much for which to bless God and so much that reveals that His name is holy as our Great benefactor. "We should inquire into the intricacies of the creation and teach our children how the glory of God is revealed therein. As kings, we are called to rule well the creation and to glorify God and promote His kingdom with it. God gave us this beautiful and intricate creation for a purpose. That purpose is that He might display to us, His covenant children, glimpses of His majesty, power and beauty."